We all know that deserts are one of the driest places in the world but did you know that the Atacama desert in Chile is the driest. To understand what that really means let’s take as an example the Sahara desert (the worlds largest hot desert) and note that it receives a meager 2mm of rain each year. Now if you think that’s nothing then just imagine how dry the Atacama is when it receives just 0.1mm per year. In fact some parts of the desert have not seen rainfall for over 400 years making it in most estimations the driest place on the planet earth. Located west of the Andes and sprawling across a stretch of almost 600 miles a small region of the Atacama is so unlike anything else on the planet that it’s been compared to Mars. In fact due to it’s strange appearance not only have movies been filmed there e.g. Space Odyssey but NASA have continued to use it as their testing grounds for equipment, projects and instruments when preparing for Mars space missions. Do People Live There ? For an extremely harsh environment you’d be surprised if anything could survive there, however there are small communities located near the various natural oases that exist within the desert. In fact some of these settlements have been populated for thousands of years going back as far as the earliest of ancient civilisations. As well as being extremely rich in copper it also carries the largest natural supply of sodium nitrate. This was mined heavily in the early 20th century for use in fertilizers and gun powder. However after the discovery of the Haber process (early-mid 20th century) sodium nitrate could now be synthetically produced and most of these mines were closed. According to estimates the desert is still littered with up to 170 of these old mining towns which lie completely abandoned like ghost towns. 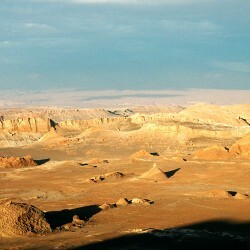 The Atacama is also one of the best places in the world for astronomy. Thanks to its location (i.e. high altitude), dry weather (i.e. very little cloud cover) and non existant light pollution it’s home to two of the worlds top observatories. Namely the La Silla and Paranal observatories owned and operated by the European Southern Observatory. In addition to these on the 3rd October 2011 it also officially became home to the most expensive ground telescope in the world, otherwise known as ALMA. The telescope consists of an array of 66 radio telescopes all using radio waves to peer deep into space helping us learn more about star formations especially during the early years of the universe. So there you go, that’s the Atacama desert for you. Hope you enjoyed the facts.